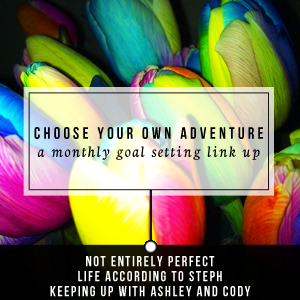 This month, I'm joining other bloggers on a goal-setting link up. The theme? Get organized. November is a perfect time of year to get organized. For me, November is sandwiched in between two of the busiest and best months of the year. If I'm going to beat holiday stress, it is going to come down to how I spend my November. What do I really want to organize this month?? Everything you can think of. I'd love to have an organized and beautiful home office to blog in (currently on a folding table, people. Or the couch. Definitely not ergonomic). I'd love to have completed all of the tasks on my 2014 goals list. I would love to be caught up on laundry, organize my cupboards, and sort through all of my junk drawers. I would love to have everything non-holiday related done and organized due to the write-off that is called December. I would like to have a life outside of holiday cheer. I would like my house not to drop off my radar during gifting prep. It's just not realistic. I have streamlined a few legitimately attainable goals in order to infuse my life with a much needed sense of accomplishment. And organization. Oh boy, do I ever need to feel organized. Holiday gifting: Have a full December action plan for projects/present making. Order everything if I am ordering anything. Get mailing addresses for out of town family. Holiday cheer: Prep little packages of "YAY IT'S DECEMBER!" goodness for the munchkins--at least the ones big enough to understand. I'm thinking.... Thunderpeep letter to santa kit, some sort of Advent Calendar, and a box of cookies from my (first ever!) cookie exchange. Yea... Simple but sweet. Home office: It's time to toss, sort and shred. My piles of crap have gotten out.of.con.trol. I might not be able to upgrade the folding table just yet, but I can definitely get rid of my "to shred" box and get some floor space back. Clutter control: I have a terrible tendency to make "outboxes" and never move them. I have about five boxes of clothes, home decor, kitchen gadgets etc. ready to go to goodwill, but have been too lazybusy to actually bring them to the donations bin. This is a good month to get those space suckers out of the house. 2014 Goals Completion: I would feel much more organized if I were able to cross the room reveals off of my 2014 goals list this month---the Craft Room and Guest Room. They have been basically finished for long enough that they are messy and lived in looking. Which ain't great for blog photo purposes. I think this month I will aim to cross off at least ONE from the "to-be-blogged" list and, therefore, consider it complete for my year's goal list. I would even be happy with just the pictures part, if I'm being honest. So really---this goal is as simple as "clean your house". Easier said than done? I'll be posting my update at the beginning of December, and linking up on Not Entirely Perfect, Life According to Steph, and Keeping up with Ashley and Cody blogs. I'm hoping that the 13 days left in the month is enough to whip me into organizational shape. Wish me luck! Tags: 2014 Goals, Blog Hugs & Creative People, Link-Up! If you have enough boxes, they may come pick it up! That's what I do - in Chicago, the Salvation Army truck always drives around and you can just call and let them know you've left bags on your front porch for them. So easy.